Puppies spend most of their time sleeping. Puppies, just like human babies, need lots of sleep to grow properly. For frazzled puppy owners, sleep can be a welcome break from the chaos of constantly supervising a hyperactive puppy. Puppies tend to be very hyper during the day, and sleep gives their bodies a chance to rest and recuperate from all of that activity. Puppies dream just like humans, and dreaming may play an important role in learning and memory, according to dog behaviorist Stanley Coren. During rapid periods of growth, puppies spend more time sleeping, indicating that sleep may play an important role in growth and development. Just like infants, young puppies are unlikely to sleep through the night, and may wake up several times to go to the bathroom or seek comfort. 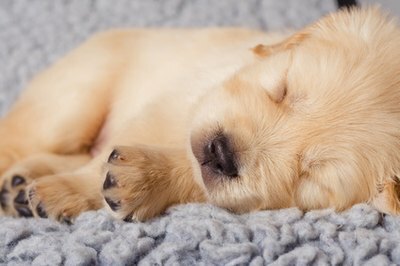 By 16 weeks, most puppies should begin sleeping through the night, though there may still be occasional nights your puppy needs to get up and go outside. On average, you can expect your puppy to sleep six to 10 hours at night. Puppies spend 16 to 20 hours sleeping every day depending upon their age. This means that, in addition to her 6 to 10 hours of nightly sleep, you can expect your puppy to spend as much time during the day asleep as she spends awake. Most puppies take a nap every hour or so. Puppies tend to play a lot before nap time and then slowly calm down before falling asleep. Your puppy will wake up energized and ready to go again 30 minutes to two hours after falling asleep. Puppies sleep best when their owners are nearby and their routines are regular and predictable. Give your puppy a crate to sleep in and make it a comfortable, welcoming and quiet place by adding blankets and putting it in a quiet area of your home. Some puppies are comforted by sleeping with their owners, and if you can tolerate a few nights of restless playing in your bed, your puppy will quickly adapt to sleeping with you at night. How to Raise a Puppy You Can Live With; Clarice Rutherford et al. How Long Can You Leave a 12 Week Old Puppy in the Crate at Night?